On the TCT show in Birmingham, 3D printer manufacturer Mass Portal will introduce an all new product line — professional-grade filament dryers for the open-materials 3D printing industry. Drying of raw materials has always been an essential step in the polymer processing industry, helping avoid cosmetic defects and performance issues of manufactured parts. The deteriorating influence of water on polymer melt stability — and consequently on 3D printing process and properties of 3D printed parts — is likewise a known issue, but one that has largely has been ignored by the open materials desktop 3D printing industry. enables use of moisture-sensitive materials that are otherwise unprintable or deliver unacceptable results. Feeding filament conditioned under controlled ambient conditions further improves process stability and repeatability — removing the variations in ambient temperature and relative humidity. Basically, use of properly dried and conditioned material unlocks the possibility to print parts with the maximum performance properties that the 3D printing materials are capable of delivering. For end use parts or industrial production applications, this is of utmost importance. Mass Portal Filament Dryers feature an easy to use touchscreen software that provides connection to an online materials database — for most materials, running the drying process is as simple as selecting the material from the list. For advanced users, ability to create custom, multi-step drying profiles is provided. Mass Portal Filament Dryers are compatible with most 3D printers, both 1.75mm and 2.85/3mm filament diameters, and most widely used open materials spool sizes. Mass Portal designs, manufactures and sells high definition, “open materials” 3D printing systems. Pharaoh® series thermoplastic 3D printers, introduced in 2014, are known for the highest part surface quality in industry. 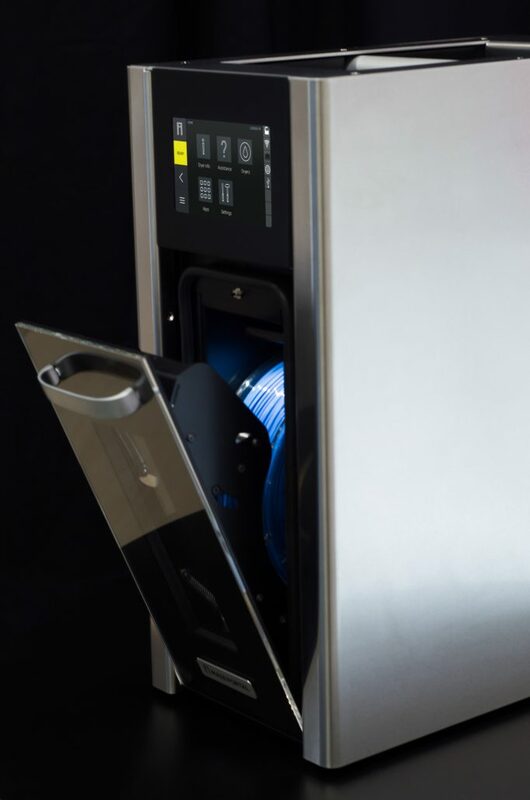 In 2016, Mass Portal introduced the Dynasty® Additive Manufacturing System — an automated printfarm that brings thermoplastic 3D printing technology beyond prototyping into the low-volume plastic parts production industry. Now, with the Filament Dryer line, Mass Portal is delivering a solution for raising the actual performance and materials compatibility of any “open materials” 3D printer.